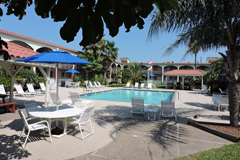 Surfside Courtyard Condos,The Best Kept Secret on North Padre Island,Texas! Owned by families, designed for families, Surfside has long been a family secret. Spacious 2 bedroom, 1 bath, kitchen units that open to the large, lush courtyard, pool, cook-out facilities and cabanas. (all our units are non smoking) Inquire about our properties for your next vacation. The Surfside Courtyard with its freshwater pool is a tropical paradise of warm sun, and lush green palms and foliage, a real getaway. Picnic family-style under a cabana, relax by the pool, or explore around the island, there is always something fun to try. 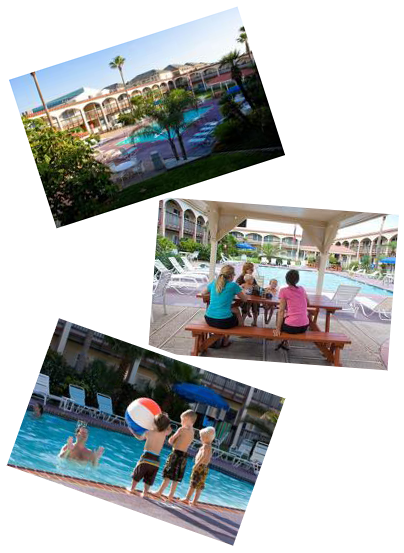 Surfside is a world of vacation fun and activities. The Padre Island sands offer ever changing playground for fishing, surfing, swimming, beachcombing, or just soaking up the sun. Deep sea fishing boats depart Port Aransas daily – just 20 minutes away. What is happening at Surfside Condos? From Surfside Courtyard Condos it's just a short stroll to the beach, anchored on the north by Packery Channel and on the south by Bob Hall Pier and the National Seashore. Corpus Christi - "the sparkling city by the sea" also provides excellent shopping and fine restaurants, arts and entertainment for all ages. Beautiful courtyard with BBQ's. Close to Packery Channel, great fishing. The beach is just across the street! A quiet & serene place to stay. Your home away from home. Inquire about our properties for your next vacation. The Best Kept Secret on the Island! Treasure Island Golf, Horseback Riding on the Beach, The Salty Dolphin Gift Shop and Golf Cart Rental. Relax and enjoy our heated pool or take a short hop to the beach nearby! Keep connected to your home or business – Always No Charge! 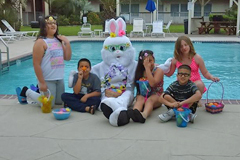 There are many activities for you and your family to do on the Island and in Corpus Christi. We can accommodate your pets so they can enjoy the beach activities too. Stay in touch with us, and visit or 'Like' us on our FaceBook page. Also, be sure to checkout our reviews below. If you enjoyed your stay with us, please feel free to post something about it or even provide us a review. Any feedback regarding areas we need to improve upon, we'd also love to hear from you.